Detail: Chinese dragon Gules in the centre of the label of three points Argent. Arms: Azure, on a chevron Argent between in chief dexter a lion rampant double-queued Or and sinister an eagle rising wings elevated and addorsed Or armed Gules holding in its dexter talon a sheaf of arrows points downwards Proper and in base a Chinese dragon Or langued Gules horned and whiskered Argent, the constellation Southern Cross (Crux Australis) as four main stars each of seven points and the smaller star of five points Azure between dexter a shamrock Vert and sinister a rose Gules barbed Vert seeded Or; Debruised in the lifetime of his father and grandfather with a label of three points Argent, the center point charged with a Chinese dragon Gules. Badge: Riley James Kelly uses the badge of his grandfather, Francis Graham Kelly. Private Registration: Arms: United States Heraldic Registry, Registration Number 20100321T, March 21, 2010. 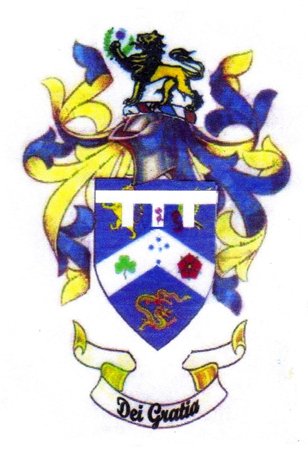 During the lifetime of his grandfather and father, Riley James Kelly uses the coat of arms of his grandfather, Francis Graham Kelly, differenced by a white label of three points with a red Chinese dragon in its centre. Riley's father Andrew uses another differenced version of Francis's coat of arms. The armiger has English, Irish, and Scottish ancestry through his grandfather and has Filipino and Chinese ancestry through his grandmother. His grandmother's ancestry is represented by the eagle Or for the Philippines, the arrows Proper for Spain, and the Chinese dragon for China. His grandfather's ancestry is represented by the rose Gules for England, the shamrock Vert for Ireland, and the thistle Proper for Scotland.